I’ve been on a huge DIY kick these past few months. It’s always interesting to makeover one area of the house because the rest of the house looks so sad compared to the newness of your recent update. We’ve tackled our dining room, fireplace and mantle and pretty soon we are moving on to one of the bathrooms. Since it’s summer, we’ve been paying extra attention to our yard. 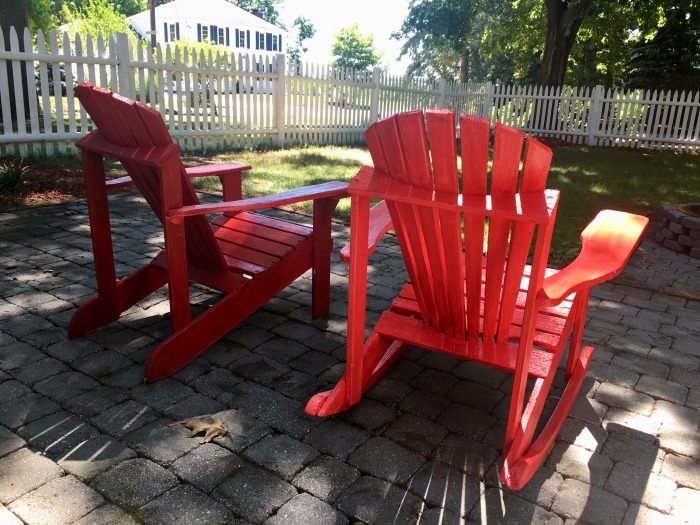 There’s always work to do, but our two Adirondack chairs were in need of CPR. We’ve had them for years and kept saying we’d either paint them or buy new ones. Year after year, we’d sit in them outside and wish they looked different. They were just screaming to be painted! Below is what they looked like after we sanded them. We did this right before we painted them. 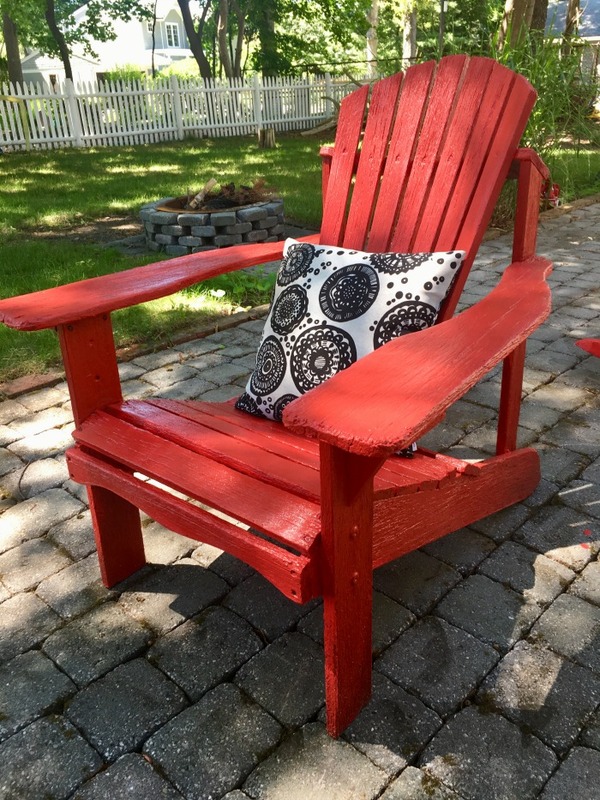 One of my favorite things about Adirondack chairs is they typically come in fun colors. You’ll always have the classic white available, but I wanted something bold. Our door is bright red and really pops against the light gray of our exterior. Having that same look for the chairs would accent nicely . So, red it is! The exact name is Real Red, in fact. 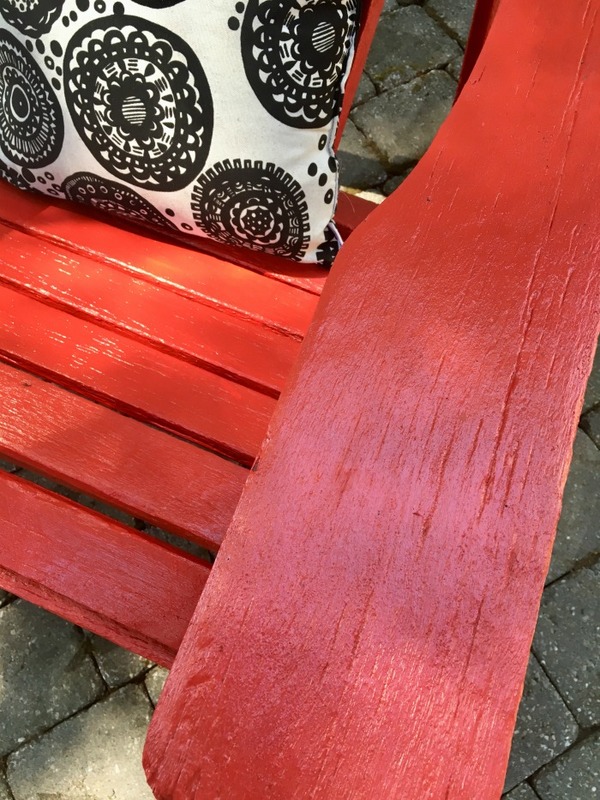 If you’re thinking of painting your own wooden Adirondack chairs, be sure to buy the right paint. Choosing a color is half the battle. For a nice thick coat of paint, acrylic latex is wonderful for prevention of peeling and cracking. I think any brand you like works fine, just make sure you get a really good quality exterior paint. Since our chairs were pretty beat up, the first coat of paint soaked right in. And because I chose red, I knew we’d need three coats of paint. 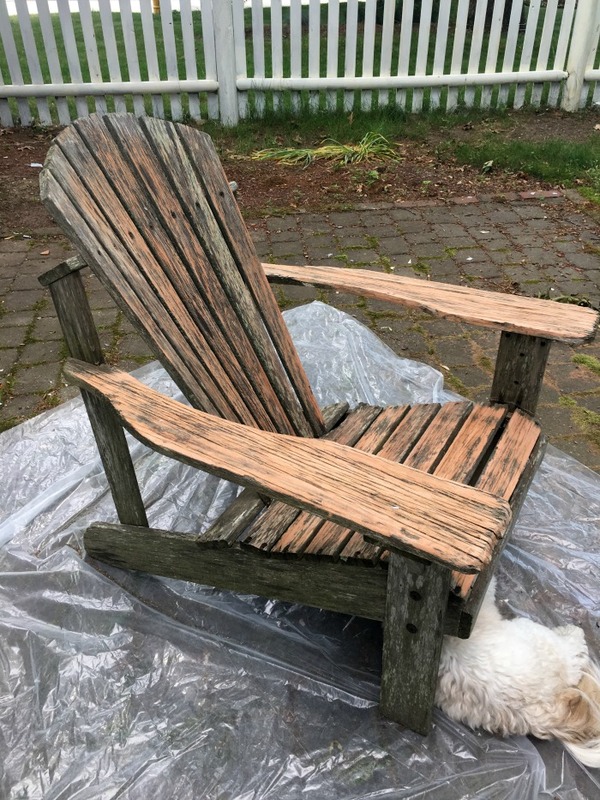 My dog did not care that I was about to paint this chair. It’s Gryfiin’s world and I’m just living in it! The salesperson at Sherwin Williams recommended I paint the first coat white or gray and save the last two coats for my red. 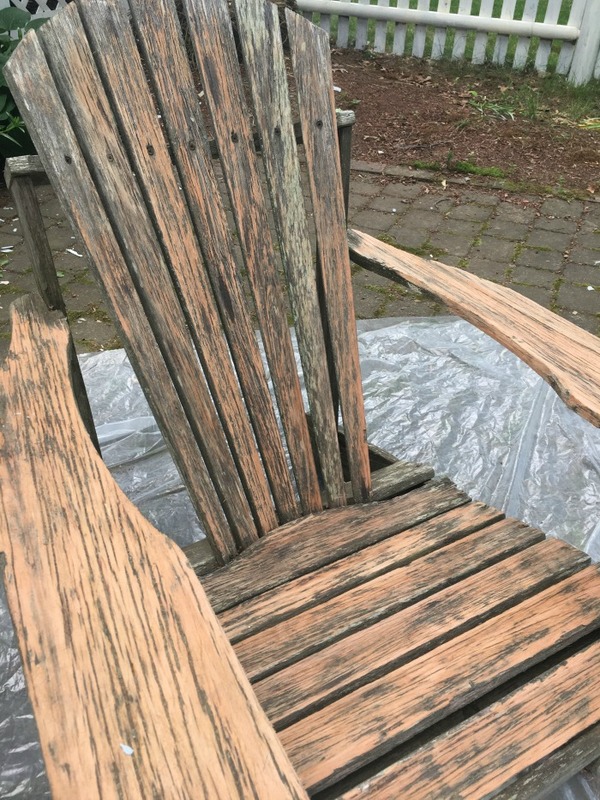 The paint was expensive (but worth it), so doing the first coat in the paint I used for our exterior of the house saved me some chair paint. If you choose a darker color, be sure to do the two recommended coats after your base coat. Think of it like nail polish. The red first went on streaky and light. Almost pink. Then really picked up its actual hue by the third coat. Look how nice the paint filled in all of those creases in the wood! The paint is so thick it’s almost like a coat of plastic is protecting it. That’s thanks to the latex and acrylic in the paint. 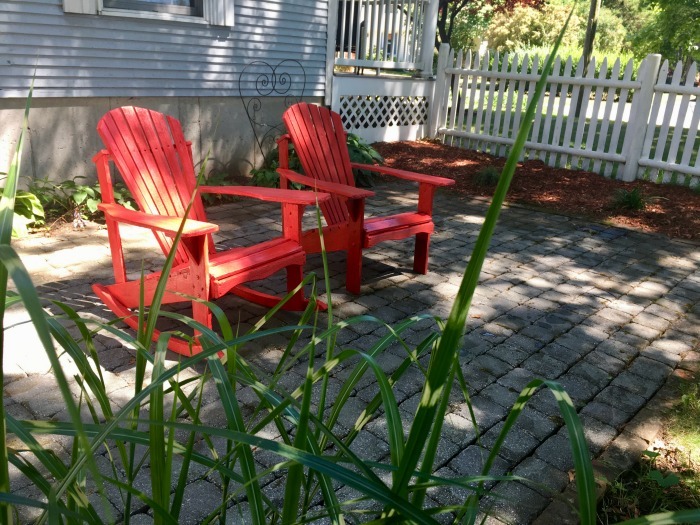 These once sad chairs are now full of life and look great in the yard. Would it have been easier to get rid of them and buy some $20 plastic ones at the hardware store? Sure. But, where’s the fun in that? For added comfort, I found outdoor pillows for less than $10. $9.99 for both actually! What do you think? 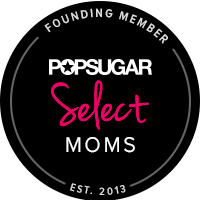 Have you done any DIYs in your home recently?